Prime Office for Rent | Manchester NH 889 Elm St. 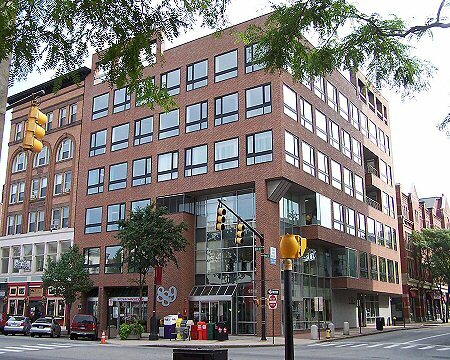 Located at the corner of Elm Street and Hanover Street–directly across from City Hall. Description: Distinctive 43,000 square foot modern, brick-clad, six-story office building directly across from Manchester City Hall. Serviced by two high-speed elevators. Available Space: Sixth Floor:	4,4781 +/- rentable sq. ft.
Fifth Floor: 3,657 +/- rentable sq. ft. (can be sub-divided to 2,452 +/- rentable sq. ft. and 1,203 +/- rentable sq. ft.) Third Floor:	7,201 +/- rentable sq. ft. (full floor) Second Floor: 4,084 +/- rentable sq. ft. (can be sub-divided to 2,489 +/- rentable sq. ft. and 1,595 +/- rentable sq. ft.) First Floor:	1,433 +/- rentable sq. ft.
Utilities: Natural gas, town water and sewer. Rental Rate: $15.00-$16.00 per square foot plus utilities and office cleaning. Operating Expense: Tenants will pay their pro rata share of increases in building operating costs above expenses incurred by the owner during the initial lease year. The owners of 889 Elm Street have reserved a number of parking spaces in the city owned Victory Parking Garage on Amherst Street.